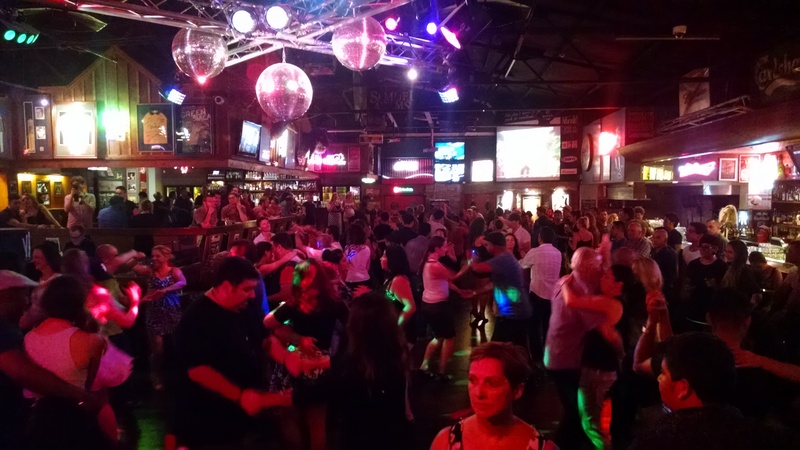 Danza Loca offers Perth's most popular Salsa, Kizomba and Bachata classes in great central locations! Add some sizzle to your wiggle with one of our fun and funky dance lessons, in convenient central Perth locations! If you're brand new to dancing, why not try out one of our FREE introductory lessons? No prior experience or partner required! Click on a class on the map below, or simply keep on scrolling to find out more! 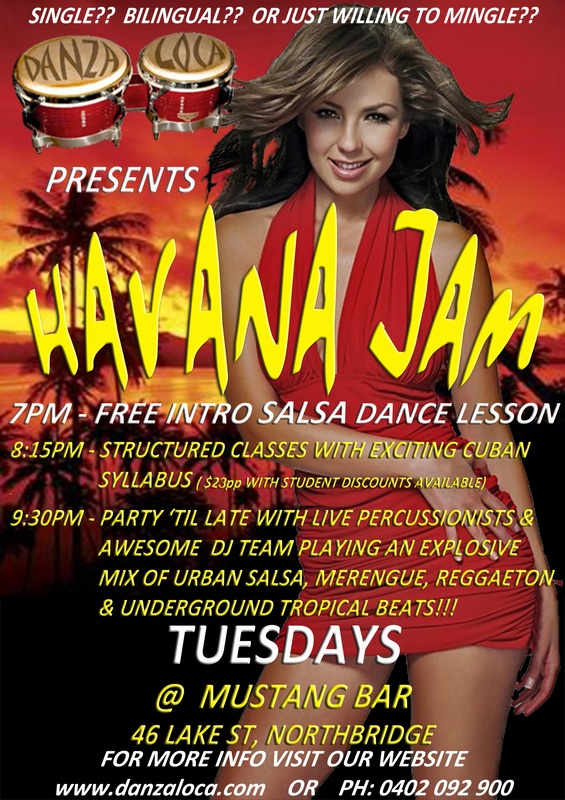 Come party with us after classes every Tuesday with Latin DJs (No cover charge!!) at the Mustang Bar This is a superb venue for Salsa, huge but cosy at the same time, and extremely versatile. New students are most welcome to join us EACH AND EVERY WEEK at 7PM for a FREE introductory lesson, and the regular paid structured classes at 8PM. You don’t need a partner or any dancing experience! The Mustang bar is a licensed venue so you MUST bring valid photo ID! We are pleased to announce the return of our Advanced level classes, at the Mustang Bar from 7.05pm. Current Intermediate 3 students wishing to try a higher level are also invited to attend, on the condition that they maintain their Int 3 classes (at 8.30pm) until they pass that level. You will attract the discounted rate for doing 2 classes in one night( $18/class). Our 2 hour intensive workshops on every week at King St Arts Centre (Just a short walk from Northbridge and the Perth city malls, and lots of parking nearby!) These classes are still the best way to really focus on developing your STYLE, with the first hour totally devoted to BODY MOVEMENT, SHINES and complimentary other Latin Styles to get you looking like the dancer you really want to be. 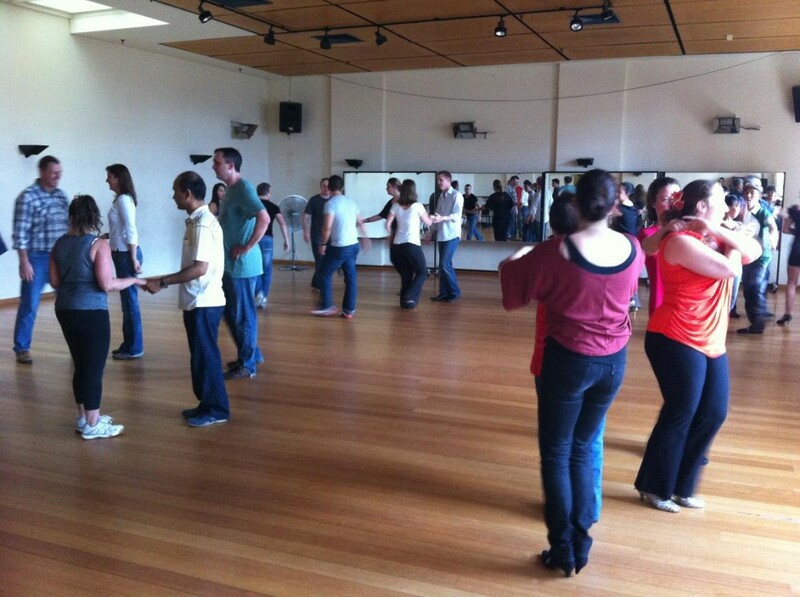 3:00 pm : Body Movement, Shines and Latin Styles – Salsa/Cha-cha/Kizomba/Bachata/Merengue/Reggaeton depending on the week! 5:00 pm : Join us for a relaxing drink across the road at Door 49 or The Belgian Beer Cafe after class! Our acclaimed bachata and kizomba syllabus in a special studio environment! To welcome newcomers to the fold, we are also running FREE INTRODUCTORY classes for each of these sensual styles so you can dip your toe into the water! 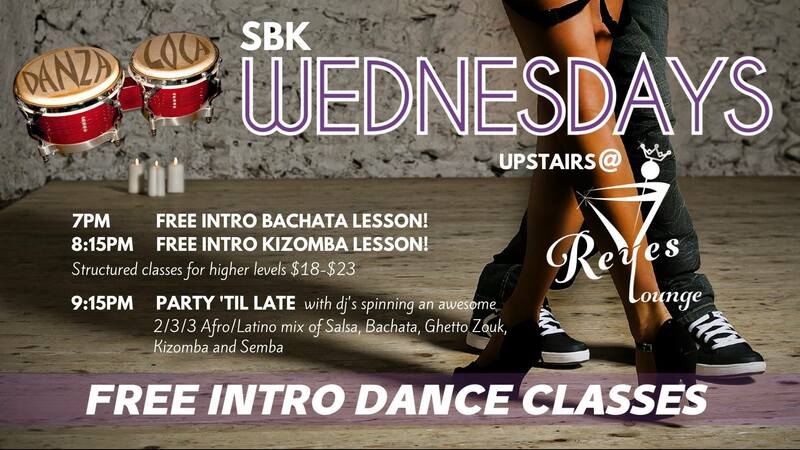 Improve your Bachata and Kizomba every week with our Wednesday classes and free SBK (Salsa/Bachata/Kizomba) party afterwards in this beautiful licensed venue! Whether you are new to these beautiful dances or are an experienced dancer wanting to take your dancing to the next level, these classes will accelerate your learning and understanding. We offer 3-4 levels running simultaneously so you can progress at your own pace. No courses or lock-in contracts, just great practical teaching at YOUR level from our awesome teaching team! 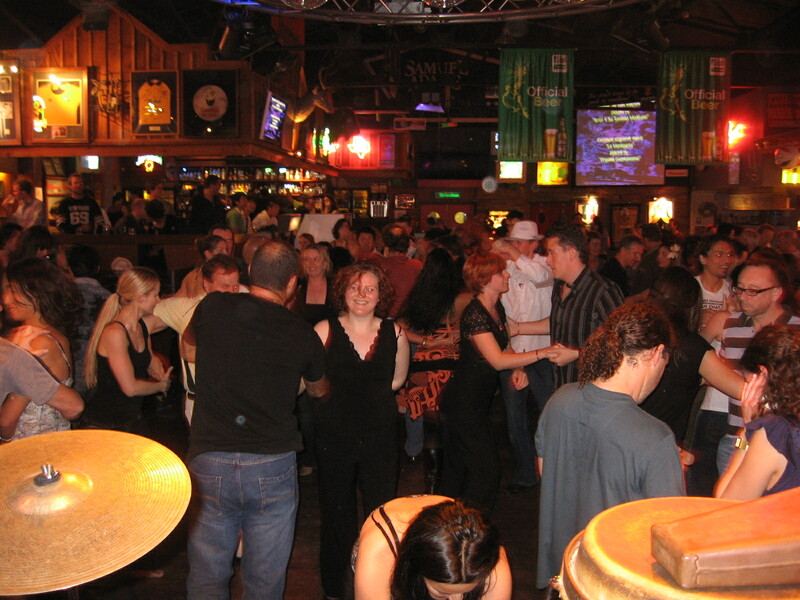 9:15 pm : FREE SBK Social dance/practica – all welcome! Classes and Party every Thursday! Danza Loca are delighted to announce our new classes in 2 rooms, with something for everybody who loves this hot venue for dancing! 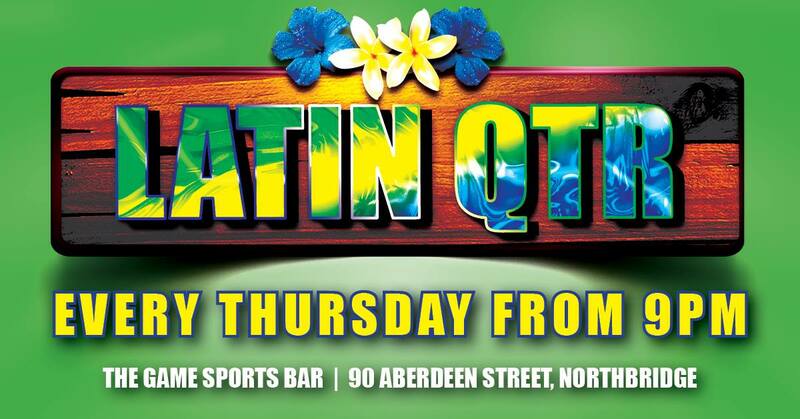 9:00 pm : After class party with DJ Mateo (Perth) and DJ Jam (Columbia) in Zone 3 until 2am! Please always remember to bring your valid photo ID to licensed venues! You must be over 18 & cannot do a class without your ID They will be checking everyone’s ID if you even *look* under 25. Most Salsa venues have a neat & smart dress code. A secure fitting shoe is highly recommended! Men be aware that no shorts or tanks are allowed in line with most venues’ dress codes. If it is your FIRST TIME, please register at the door. You must fill out a short ID and disclaimer form to join the classes (just once) Please check in early and when you arrive so you don’t create delays and miss the start of your class. Thank you! Introduce a friend to ANY Danza Loca classes (ZUMBA, Salsa, Bachata or WHATEVER! ), and we’ll give you BOTH 50% off their first class! This offer is to benefit current students who bring “new” students to our classes. The new student will need to register as your guest (at class reception) on their first session. Bring more than one guest, and we’ll give you a class discount voucher (50% of course!) for each one, that you can use at a later date. The system will work much easier if the “host” accompanies their guest at their registration. Yes, once your friend has joined, they will also be able to benefit from this offer and bring their own guests to Danza Loca classes. Besides our regular weekly classes we also offer plenty more dance styles, including special one-on-one private classes and Bridal/Wedding packages. Any more questions that we haven’t covered already? 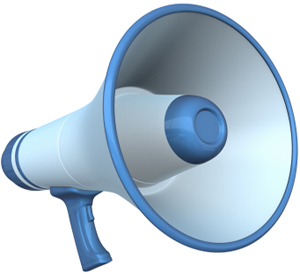 Try the FAQ, or drop us a line using the contact form! 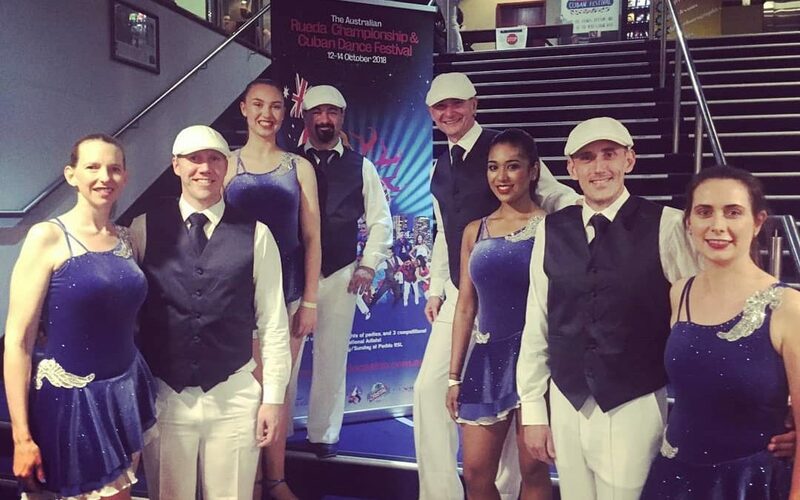 We’re super proud of the hard work the entire team put in to be awarded the Most Synchronised Team (Pro Division), as well as our very own Dee for bringing home the Best Female Dancer Award! !